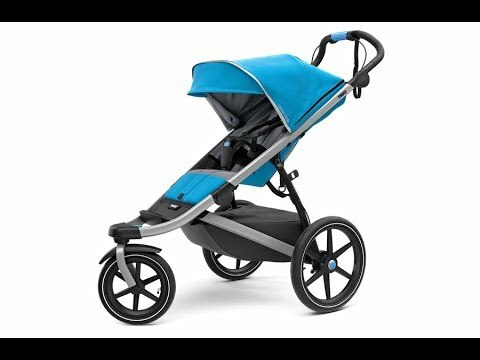 This light, compact stroller has passenger amenities you’d love in your car: a reclining seat for napping, rear suspension to smooth the ride, and venting mesh and an adjustable canopy for climate control. Your needs haven’t been overlooked either: the ergonomic handlebar with an easy-to-use twist-brake adjusts to fit different users and activities, and the stroller folds up one-handed for easy transitions into vehicles. Twist-brake provides easy on-the-go control, letting you set the perfect pace. UPF 50+ polyurethane-coated canopy provides adjustable protection from harsh UV rays and the elements. Use it for jogging with children 6 months or older. For strolling, children younger than 6 months must be in a car seat with the Thule® car seat adapter. Large rear wheels handle uneven terrain well. Front wheel pivots for easy turning or locks into place for jogging. A micro adjustment ensures straight-line travel. Reflective detailing on the wheels helps keep you and your passenger visible. Narrow design is aerodynamic in use and folds to a compact package for storage or transport. Peek-a-boo roof window lets you keep an eye on your passenger. 5-point padded harness for security and comfort. Seat back reclines 165° to a near-flat position for naps. Storage includes a removable under-seat compartment, a large mesh seatback pocket and 2 small mesh pockets inside the carrier. Integrated cross bar accommodates accessories like a console or cup holder (each sold separately). Safety wrist strap prevents runaways. Foot brake locks and releases without bending. A fixed front wheel won't rotate, which is ideal for jogging. A lock-out pin allows for the wheel to be either fixed or to rotate freely increasing manoeuvrability. A hand brake can help runners maintain pace and form while running downhill. A parking brake prevents the stroller from moving while loading and unloading on flat surfaces. The maximum cargo capacity including the weight of the child(ren) in child carriers. Suspension improves on and off-road handling and ensures a smooth ride on uneven terrain.